The Online Trace Nitrogen Analyzers in Argon / Helium Analyzers. High Purity Argon / Helium is a requirement of Lab instruments, Chemical Plants, Welding, Semiconductor Manufacturing. This has necessitated measurement of Trace Nitrogen the major impurity in Argon / Helium at various stages of production, transportation and End use. Our reputed entity is engaged in supplying Trace Gas Analyzer. 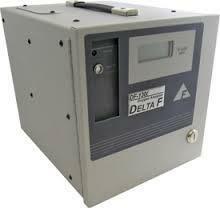 Due to the ability of our personnel in this field, we provide Trace Oxygen Analyzer . Application: Measuring low concentration of required gas in PPM range. A choice of configuration is available. The most convenient and economical is a standard analyser with the cell mounted on the rear. Alternatively, there is remote sensor housing complete with flow meter and valve. Accuracy: +/-2% of the active range at constant temperature. The HALO 3 trace gas analyzer provides users with the unmatched accuracy, reliability, speed of response and ease of operation that users of Optics analyzers have come to expect. We are amongst the most reputed names in the industry, offering Trace Oxygen Analyzer.